Who wants a quick E.A.S.Y. recipe? 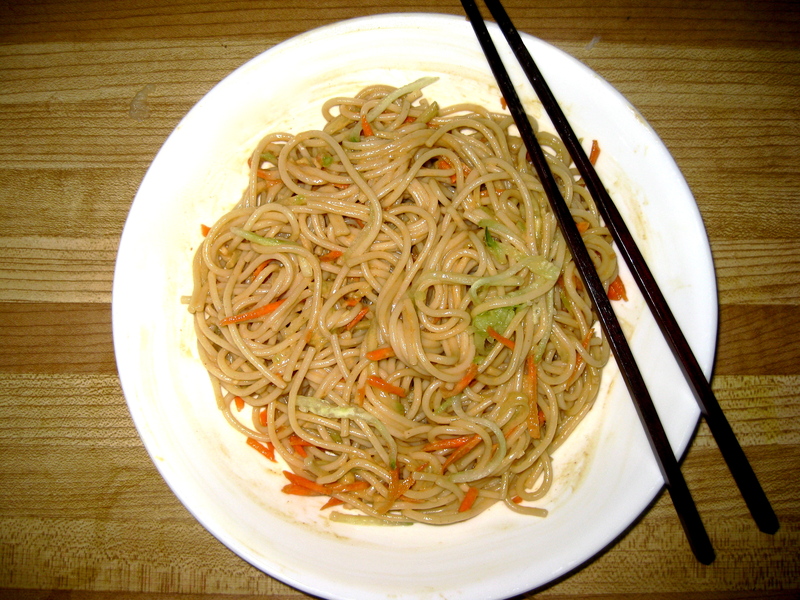 Today, I’m going to let you all in on a little secret of mine and that is, my family’s recipe for Asian Style Peanut Noodles. 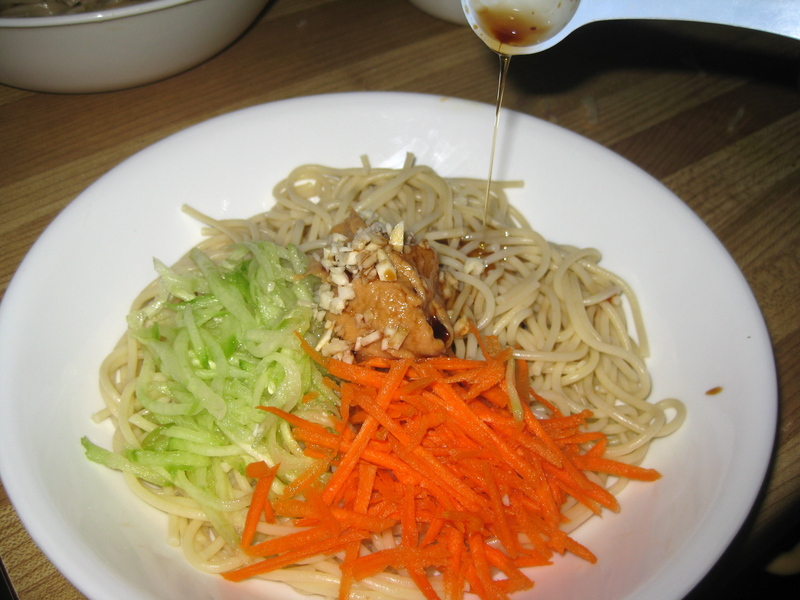 More specifically, Cold Taiwanese Peanut Noodles! This dish is great for outdoor picnics and a treat on a hot summer day. It’s easy, quick and the ingredients are usually already in your refrigerator. 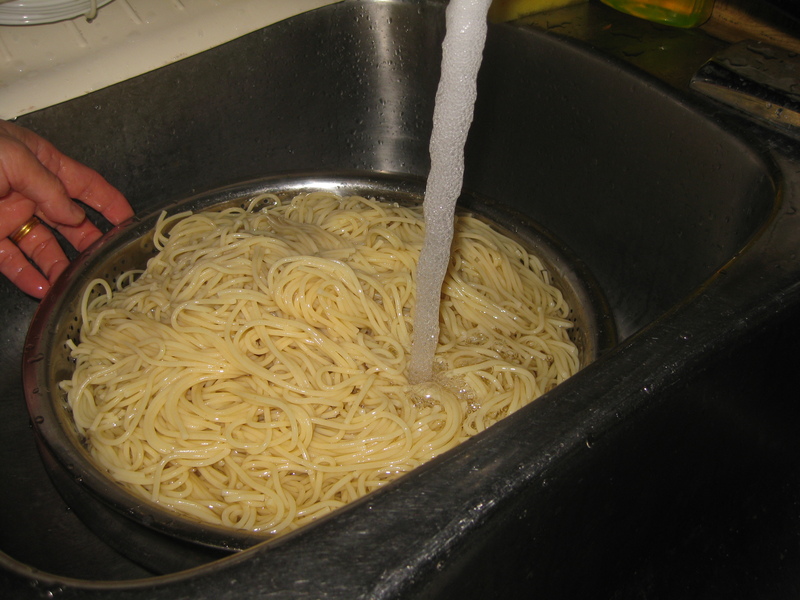 Rinse in cold water until cool. Mince the garlic! 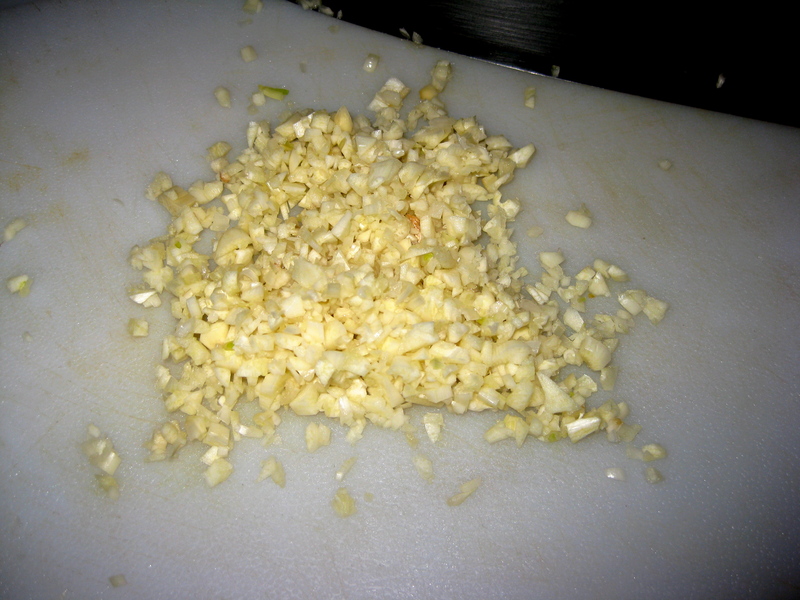 Add lots and lots of garlic. I love garlic! We made a picnic portion so an entire box of spaghettini, we used an entire ball of garlic. I’d say half to one clove per bowl of noodles. 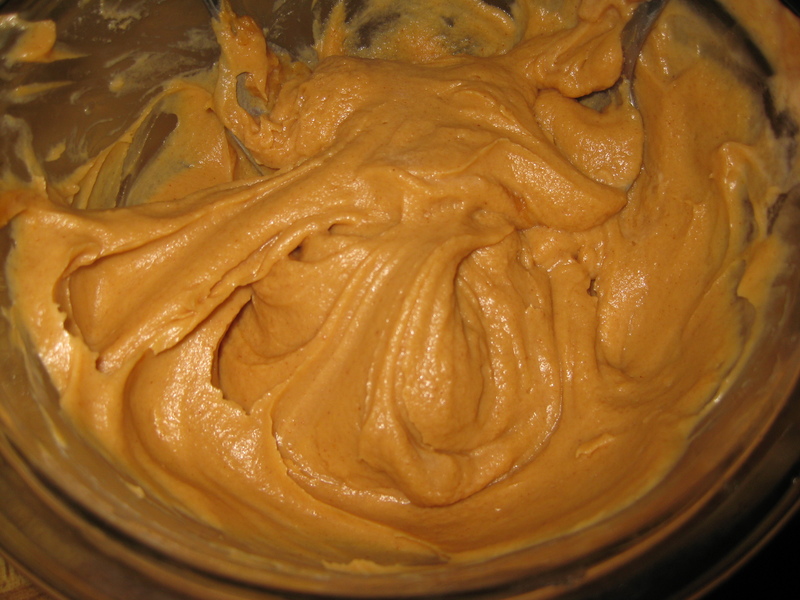 Equal Ratio of peanut butter to water, and mix till smooth. Per bowl, one spoonful of peanut butter. Add to taste later if not enough. 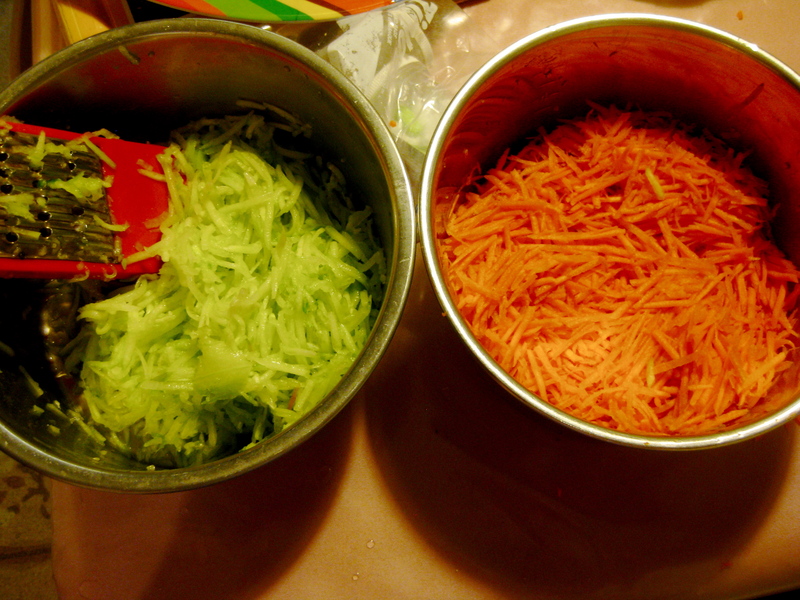 Shredded Carros and Cucumbers. Leave the skin/peel on for cucumbers for more color. Tablespoon of soy sauce per two servings(shown above) (so 1/2 for one). 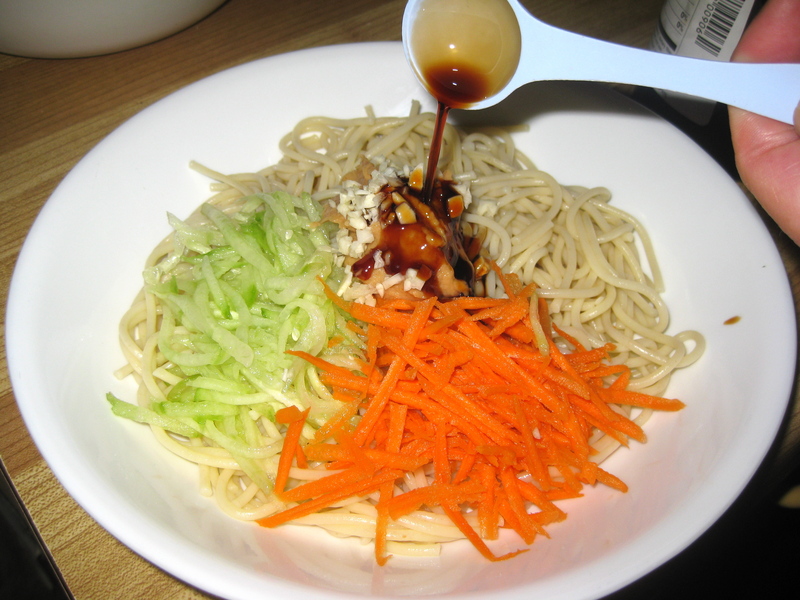 Tablespoon of sesame oil per two servings also! It makes a huge difference! For protein, add shredded chicken or sauteed firm tofu! For a kick, add some asian hot sauce. My oh my, it is oh so good. Please try it!!! -it helped to have bought a designer shirt that made me look pregnant and kept me motivated. -My focus was purely on eliminating white carbs and sweets also (not adding) sugars to my food…calorie count, etc… was not my focus. -I think by focusing on one thing (in my case 2 ) I was able to keep disciplined. – I lost 20 pounds between Jan-June, then put on 7 pounds in the summer….and since September that weight is off ! -the weight loss was steady, nothing drastic, and except for the summer glitch (which was due to mom’s pasta, which I have since got her to buy whole wheat) everything is back on track. -another friend recently came over and warned me about the dangers of sodium. He went through my fridge and cupboards and told me how everything was a killer! Now I can spend 5-10 minutes in a grocery store comparing sugars & sodium content in granola cereal!!!! -As you take the first step and get a comfort zone with it, you will be ready to add to the mix…first sweets then carbs, then sodium, then calories…until eventually I’ll be a pure vegan one day, Never !!! -cheats: at first I went “cold turkey , but came to understand that the body can take small doses and restrictions are negative, so on the odd occasions a slice of cheesecake or tiramisu is in order, but a small piece ! Keeping on top of social media, I follow many nutrition blogs, Twitter feeds and Facebook groups. It keeps me up to date in the world of healthy eating. Through this amazing cyber world I met Aviva Goldfarb who works and lives in Maryland. 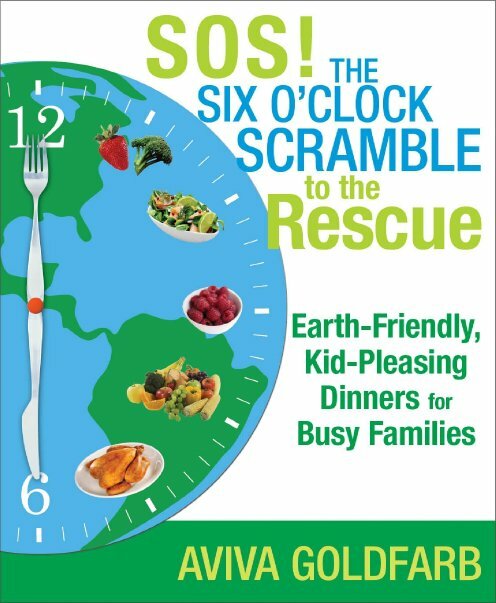 She is the author of the new cookbook SOS! The Six O’clock Scramble to the Rescue. I was trying to win a copy all summer but ended up heading over to Amazon. It sounded like the ideal book for me. It was described as being the perfect tool for busy health conscious moms. Hey that’s me! The majority of the recipes take about 30 minutes from prep to table. That’s impressive. The book is divided up by seasons to maximize seasonal produce. I have been telling clients for years that this is the best way to cook. The cookbook was deliverd in August but I didn’t read through it until a few weeks later. I read cookbooks like other people read novels. I take my time and go through every recipe. I fold over the corners if it’s a recipe I intend to make. By the time I had finished reading this book I had folded over more than half the pages in the book and there were a lot of recipes in this book. 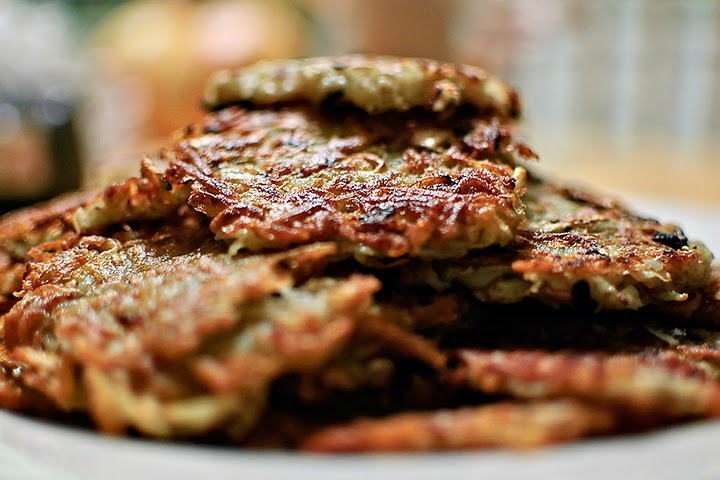 The recipes have codes for vegetarian, Kosher style, extra speedy and make ahead. Here is where it gets interesting. Aviva has a website that contains all the recipes in the book plus hundreds more. If you are a subscriber, you get a meal plan in your e-mail box every Wednesday. Each meal plan contains a variety of 5 recipes plus a grocery list. All of these recipes are tested by Aviva and 5 other families. Now if you like living on the edge than this is a no-brainer easy way to cook for your family. However, if you are picky like me and always feel like cooking what you want to cook then someone telling you what to cook is not an option. Guess what? You can customize your weekly plan with Aviva’s site. The first week I chose 6 recipes from her book that I liked. Then I added them to the create my meal plan section and then (here is the best part) I clicked “print grocery list”. It was stupid easy. I used this method the week I got my new fridge so I needed to replace a lot of food. The grocery list contained every single item I would need to make the 6 recipes I chose. I had to replace a lot of staples. The next week I typed in the protein I wanted to make and chose another 6 recipes but from the website list instead of the book. I clicked the easy button again and voila my grocery list was printed. The third week I tried a few web based recipes plus a few from the book. I really don’t like following rules so the benefit to meal planning this way is that I can decide every night which of those meal I will make. I know I have all the ingredients so it doesn’t matter which I order I cook them in. In the past, I tried chicken Mondays and pasta Thursdays but I got bored pretty quickly with this type of meal planning. I need variety and spontaneity. I am not saying this is a bad method because it works very well for many people. I just know myself and cannot commit to Fishy Friday. Aviva has generously donated a 3 month subscription to her awesome website. If you are interested please leave a comment on this post and follow Aviva and me on Facebook. I will randomly select a winner on October 26th. Thanks! The world of nutrition has been rocked by some recent studies. In the past, the belief was that dietary fats were primarily responsible for heart disease and obesity. The food industry responded by cutting fat in all their processed products. Fat was replaced by sugars. North Americans kept getting bigger and the problem with heart disease was getting worse. People became fat phobic and shunned anything they perceived to be high in fat including healthy fats found in nuts and seeds, olive oils and even avocados. It should come as no surprise that current research indicates that dietary sugar is problematic. It seems that highly refined carbohydrates are worse for your heart than saturated fats. Consequently, the term carbohydrate is horribly confusing for most people. I ask all of my patients to define it for me. 90% will say bread, pastas, rice and cereal. They are not wrong. However, those foods are considered simple carbohydrates because they are made from refined white flour. Complex carbohydrates are not highly processed and have a low glycemic index value. These foods include: legumes, brown rice, whole grain bread and whole wheat pasta. To make matters even more confusing there are carbohydrates in fruits, vegetables and even milk. However, the fiber in the fruit and vegetables and the protein in the milk are good for you. These combinations are beneficial. Consider foods such as pastries, cookies, Danish, muffins, crackers, chocolate bars, candy, cake, pies and you’ve got a list of foods made with added sugar and some of them with refined white based flour. These foods are addictive and can lead to weight gain and health issues like heart disease and diabetes. If you reduce your intake of sugar containing foods and sugar containing beverages like regular soda (and even diet soda) and juice then you can significantly improve your diet. Replace white pasta with whole wheat and white rice with brown rice. 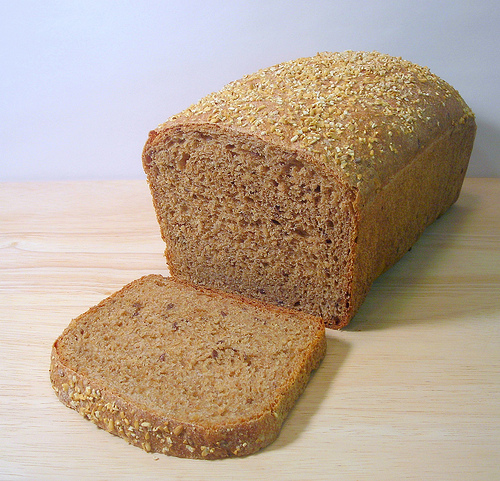 Use only whole grain breads and rolls when making sandwiches or toast. Experiment with legumes in recipes. Try making a lentil vegetable soup or a chickpea salad. Instead of making mashed potatoes with white potatoes, use sweet potatoes as a substitute. 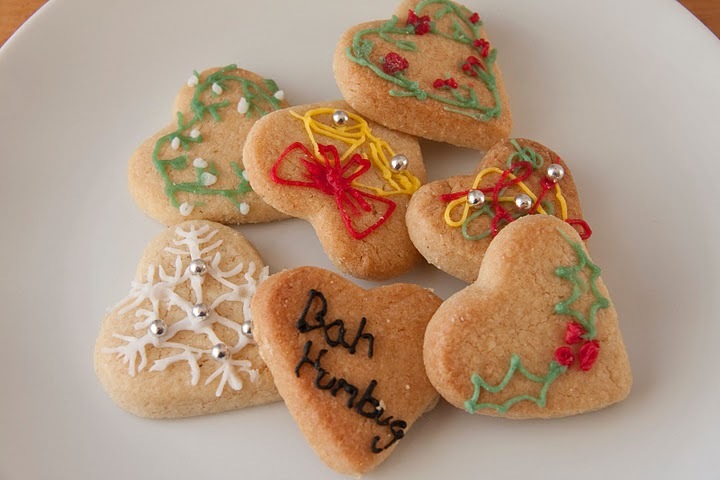 Consider baking with whole wheat flour and cutting down on the amount of sugar in the recipe. Try using unsweetened applesauce in place of sugar. Instead of juice, try homemade smoothies made from frozen fruit of your choice and milk or yogurt. feel like because it’s just too hot to think. flavour, mouth feel and enjoyment of a food or beverage. looking at a train wreck. active and I always say you got to do something you love and that is fun. Good luck to him. He just rode off to Scrabble club.